Your inner critic believes you’re a failure and wants you to stay that way. An inner finger-pointer comes from two places. Inner critics are the imagined voice of accusing authority figures and negative family members from the past. The other place your inner critic speaks from is perfectionism. Cheer when you keep struggling in the same old ways. Pat you on the back when you don’t try. Smugly whisper, “I told you so. Don’t do that again.” when you fail. 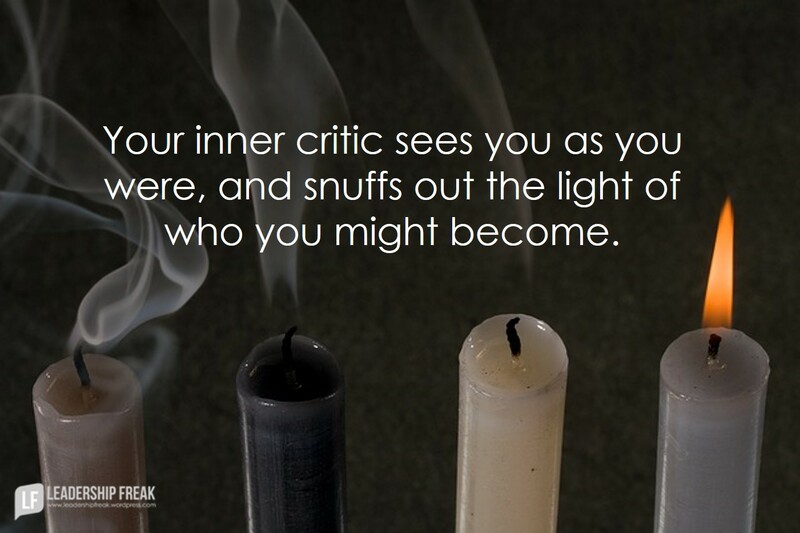 Your inner critic sees you as you were, and snuffs out the light of who you might become. Inner critics do all the talking and thrive in the shadows. They don’t like it when you speak to them. Perhaps you should talk back. Don’t bother arguing against your inner critic. You’ll lose. Instead, ask questions and say thanks. What are your aspirations for me? How are you helping me get ahead? I hear what won’t work. What might work? Sometimes your inner critic is right. When your inner critic is right, say thanks and move to next time. Inner critics love last time and hate next time. Tip: Don’t allow your inner finger-pointer to make judgments about who you are, even if it might be right about your performance. How might leaders get the most from their inner critic? Thanks Camille. I get the feel of fear that an inner critic can instill, when I read your comment. Fear is a great tool of out inner critic. 3) Why was there a difference? 4) Is there something we learned that we can apply in the future? Introspection is bad when we focus on things we did wrong or we might have done better, but that we cannot change because time has passed. 3) Resolve not to repeat it. 5) Set up a process, which might include seeking help, to ensure we are accountable not to do it again. Every one of us has scars from the past. Every one of us has done wrong or been wronged. The past cannot be ignored or forgotten. It does not have to enslave our future behaviors. Thanks Marc. Your comment is powerful because it’s practical. The thing that really stands out for me is deal with things within your control. I can see how an inner critic loves to weigh us down with all the stuff we can’t control. Thanks Bob. There came a point in this post where I had to choose between using “silence” your inner critic or something else in the title. Like you, my inner critic is alive and well. Silence isn’t an option. So I chose something more realistic for me. Glad you found it appropriate. I have a co-worker who ALWAYS asks, “how could that have been better?” Its a good place to look for improvement. I will share with her that she has a good inner critic! Thanks Will. The “How could that have been better,” is awesome as long as we honor progress as well. Personally, I get a little weary of someone who doesn’t celebrate success. I know you didn’t mention this about your co-worker. I’m sure she is good at both. Your comment, as you can read, cause a reaction in me for some reason. Yes…I agree. I have encouraged her to swim in the good jobs for a bit before being too critical or analytical in looking for improvement. This would be great advice to any aspiring athlete as well. Good post !! Liked reading it. Thanks Carlos. I hadn’t thought of that context. It makes sense. Your inner critic, saboteur or gremlin lives in your ego. This is not your Higher Self speaking. Your inner critic is doing its job: trying to protect you. Your inner critic is inundated with fear. Personally, I would acknowledge my inner critic and her concerns for me — she doesn’t want me to play big because it’s too risky — and, as you say Dan, thank her for wanting to look out for me. But I would never ask her for her advice or what might work. Instead, I would tap into my essence, my Higher Self, my divine light for those options. And yes, essence, Higher Self, and divine light, have their place in the workplace. Thanks Kim. I hear you on not asking your inner critic for advice. I should have been more clear. The purpose for the question is to quiet that voice. I like the idea of turning toward your higher self for forward facing strategies. Great post! I definitely think your inner critic can be valued. I’m always quick to point out to others that valid advice can come from anywhere. If your inner critic is inexperienced but has feedback that propels you farther down a road of improvement, then that critique is necessary and should be taken as seriously as it would if it were coming from a professional. This is especially important in the business arena. You know more than you think. And sometimes the gems of reflection are found in failure. I have been reading for a while but this one struck a cord. I have know I have a strong internal critic because I want to be better. I think that is a good thing, however, there is a reason we learn to crawl, walk and then run. To keep a healthy check on our inner critic, you said it best, it is smart to acknowledge it and then move onto the next challenge. This is very timely, thank you, Dan. To make the best of our inner critics, we must step into vulnerability – the power of vulnerability and the door it opens is transformational and extremely empowering – Creating an environment where individuals feel safe enables vulnerability – then being vulnerable as a leader, even if the leader has to “go there” a few times before it is clear to others that it is safe to do so, is one of the most powerful changes to leadership development of our times (IMHO). The learning from that point on, making the best of our inner critics, asking others to make sense of our inner critics can then become a Practice shared in a team environment. (and in our personal lives as well). Dan, I like this post, it will help me to listen to my inner critic, this way, I will be me, act as me, and win more battles as me. thank you! Your leadership blog is amazing. I have found so much I can use in my everyday life as well as in business interactions. This one hits home hard. Thank you.